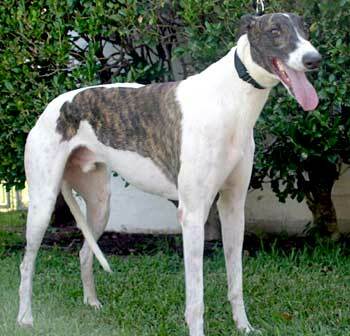 Bruno, aka Dynamo, is a handsome almost 3-year-old white and brindle male born October 25, 2004. His sire is Magnitude and his dam is Concerto. Bruno has 19 races to his credit, debuting at Valley Race Park in Harlingen on December 17, 2006, and finishing his last race on April 18, 2007. Bruno is a little shy, especially in new surroundings; he has gone through a lot of changes, so it is hopeful he will settle in soon. It is not known at this time if Bruno is small animal or cat tolerant. 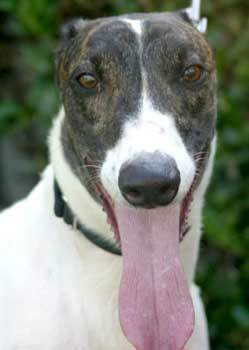 Bruno is a very handsome white and dark brindle boy. He has a striking white and brindle mask on his face that I just love. Bruno was very shy when he first came into our home, but he has really come out of his shell. He is still shy in new places (like meet and greets), but I think that will get better with time. Loud sounds still make him a little nervous, but he is getting much better! When we first brought him home, he kept going in his crate to lie down and would just watch us. He would not eat outside his crate with his foster brothers and sister. After a couple days, he gradually started coming around and trying to see what everything was all about. He now only goes in his crate when we leave the house and he eats in the room with everyone else. He is crate trained and will go in there willingly. We just give him a treat every time he goes in and he is okay. It took him about four days to actually start staying in the living room with us and coming up for hugs and kisses. Now every time you say his name, his tail just starts wagging like crazy. He does not hesitate to put his VERY cold nose on your hand if you aren't petting him when he comes up to you. He loves for you to talk to him and rub his head and ears. He will stay there for hours if you would only let him! He has realized what love is all about and just can't get enough of it! He loves being around his foster brothers and sister. They have really taught him the ropes of being in a home and it did not take him long at all to learn. Bruno has recently started picking up the stuffies and dog bones around the house and taking them to his bed after watching the other hounds. I caught him throwing one of the big stuffed animals up in the air and shaking it in his mouth. It was the cutest thing. When he saw me looking, he dropped it and lay down on his bed with it and just looked at me. I think he is still a little unsure of what is okay and what is not okay. He is very eager to learn. Bruno hasn't quite learned how to play inside with his foster brothers and sister just yet. Kiya (my husky) has tried to jump on him and wrestle and he just doesn't get it. He just kind of walks away as if to say "What are you doing to me? STOP THAT!" Now, when it is time to go outside, that is a completely different story. As soon as I open the door, Bruno and my other Greyhound (Denny) will run and nip at each other and bounce around the yard like they are reindeer. They will race to the end of the yard and then come back. I think they are just racing to see who can get in and get the bed first because they are worn out after playing outside for five minutes!!! It definitely doesn't take long! Bruno has now learned what dog beds are all about and he LOVES them. He has actually taken over Denny's bed at night. It is right beside our bed and Bruno is always the first one in the room just so he is sure to get that spot every night. Talk about a smart boy. Bruno has NEVER asked to get on the furniture at all. Even if you are lying on the couch and he wants some attention, he will just put his head on you and stand there while you love on him. Bruno has never had an accident in the house. He has learned to go to the back door and lets us know when he has to go potty. I do think he needs to be in a home with at least one other dog since he seems to feel more secure when there are other dogs around. He seems to look to them for direction. Anyone would be lucky to have this easy-going, GREYT boy in their home. Bruno truly is a wonderful boy!